Portland, OR –Well known musicians, comedians, and celebrities will gather for a free concert event at Director Park on Saturday, August 20th from 5pm - 10pm. The lineup includes Golden Globe nominated actress Evangeline Lilly (Lost, The Hobbit, Ant-Man), comedian Hari Kondabolu, popular punk band Anti-Flag, Hawaiian slack-key guitar legend Makana, Danbert Nobacon of UK sensation Chumbawamba, and buzzworthy bilingual rockers Downtown Boys. The free event is part of the nationwide Rock Against the TPP tour, a series of large-scale concerts, teach-ins, and protests mobilizing to raise awareness about the Trans-Pacific Partnership (TPP) agreement, the unpopular, anti-democratic “trade” deal that has been a hot topic in the presidential election. Organized by legendary guitarist Tom Morello (Prophets of Rage, Rage Against the Machine, Audioslave), his new label, Firebrand Records and digital rights group Fight for the Future, the tour is sponsored by Citizens Trade Campaign, Communications Workers of America, CREDO, Demand Progress, Friends of the Earth, the International Labor Rights Forum, Public Citizen, Sierra Club, SumOfUs, the Teamsters, and Oregon Fair Trade Campaign. 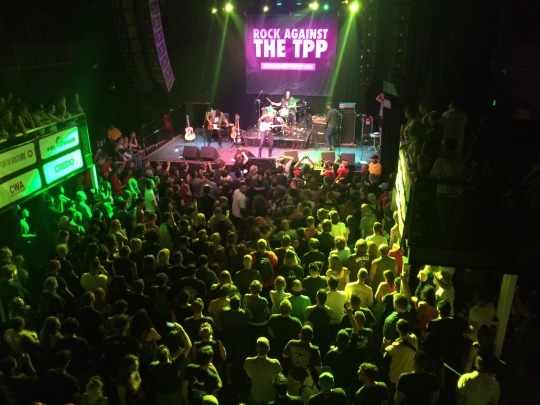 WHAT: Free, festival-style concert featuring high profile performers and speakers from a wide range of organizations opposing the TPP. Food trucks. Beer garden. Kids games. 5:00pm - 10:00pm. Evangeline Lilly and TPP experts will host a free teach-in the following day, Sunday, August 21, at First Unitarian Church at 1:00pm. WHO: Evangeline Lilly, Hari Kondabolu, Anti-Flag (acoustic), Makana, Downtown Boys, Danbert Nobacon of Chumbawamba, Son of Nun, Ryan Harvey, bell’s roar, Taina Asili, Naima Penniman of Climbing Poetree, Evan Greer, and more.